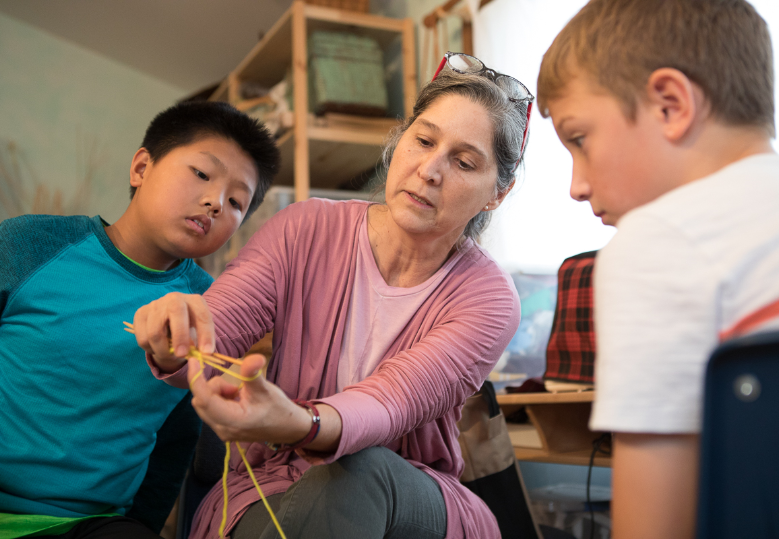 At Toronto Waldorf School, we describe our unique style of education as education from a deeper perspective™. While education is a continuous process through life that never ends, it is grounded in the experiences of childhood and a child’s experiences at school. At TWS we strive to inspire our students to evolve into creative thinkers who are personally centred and strongly connected to humanity and the environment. integrating subject matter with developmentally appropriate themes and pedagogical approaches, which appeal to the deepest interests of your child. integrating academics, arts, movement and culture to appeal to diverse learning styles and cultivate the growth of intellectual as well as social-emotional capacities in your child. providing extensive opportunities for children to be creative based on learning through designing, problem solving and developing strong capacities for analytical and creative thinking. This combination of integration and hands on experience creates the optimum opportunity for healthy cognitive and emotional growth, and for building a foundation for success in Junior/Middle School, High School and beyond. Our school year begins with the ‘Rose Ceremony’ during which the Grade 12 class welcomes the new Grade 1 into the grade school community. The transition from Kindergarten to more structured learning in Grade One is an important step for students who are excited to join ‘the big school’. This ceremony marks this important passage from Kindergarten to Lower School. Grade 1 students are eager to bond with their teacher and to be taught. They begin to experience a sense of individuality that gives them new capacities for learning and socializing; the challenges of the Grade 1 curriculum build upon these new capacities. each Main Lesson topic has a three day rhythm; students engage with the same material in different ways over three days. Movement activities take advantage of children’s developing bodies to learn and strengthen memory. Rhythmic clapping and stamping while reciting times tables engage the child’s whole body, not just the head, to fully understand the concept of times tables and multiplication. Movement activities deepen learning and balance children’s natural desires to move with the quiet listening and writing activities of the lesson. French, music (singing and recorder playing), eurythmy (a movement art), watercolour painting, drawing, modelling, knitting, rhythm exercises, form drawing, nature walks, games. Students’ development continues in Grade Two. Each child has a deeper sense of his or her ability to grow and learn. This confidence comes with a bravado and social assertion that sometimes needs to be softened for a healthy social life. The curriculum addresses this by presenting fables and stories of 'saints' or people who have had a special relationship with animals, e.g., St. Francis and the wolf. The animals in these stories reflect an aspect of our human nature that needs to be 'tamed', and the children find these stories reassuring and inspiring. the rhythm of the lesson balances quiet focus and active movement, as well as thinking and creative work. Students engage with the same material in different ways over three days. Recitation to build memory skills is central to class work. Hundreds of lines will be learned and retained over the course of the year, from the lines for the class play, to the many verses and stories told throughout the year. This capacity for memorization will stand the students in good stead in the academic years ahead. Movement and other creative activities continue to foster strong math skills. The movement process grounds the learning in the body, rather than just in the head, deepening learning and making it accessible for wider use in later years. Field trips in Grade Two build understanding of the connection between the children and our environment. They typically include trips to a farm, apple picking, skating trips and nature walks around the school and beyond. This direct experience of the natural world is an important base upon which to build future respect for the environment and the importance of sustainability. Grade Three is typically a time when children go through profound neurological and psychological shifts that occur between 9-10 years of age. We refer to this time as the 'nine year change'. The Grade 3 curriculum brings a healing element to the psychological uncertainty the child feels at this time by teaching many practical life skills. These skills reassure the children that they will be able to take care of themselves one day. And sometimes, a small building project. The stories in the Hebrew Scriptures reflect the child’s psychological experience. Like Adam and Eve, the children are leaving the paradise of childhood behind and having to go out into the world and discover how to live with other people and with the land. Measurement and its evolution: taking measure of the world gives the children the confidence that they can manage it. The learn how to measure - from a day’s journey to the king’s thumb width (which became our ‘inch’ measure!). Measuring length, width, weight and volume, charting time and handling money, all are important skills to possess. Grade four students often display self-assurance and the sense that they have ‘arrived’. New privileges are granted at school, such as the right to be on the playing field with students from the older grades. The forest playground remains a popular play location with swings, sand area and climbing structure; students often enjoy the feeling of their speed, strength and agility. Focus on group activities draws the class together as a social whole: plays, movement lessons, games, stage performances and the ‘week in residence’ at Black Creek Pioneer Village all support this end. Students need a great deal of form to meet school tasks, both academic and otherwise. Self-discipline and healthy work habits are developed at this age, often through spelling words and vocabulary lists in French. Increasing objectivity permeates the curriculum, such as the first overt science study: study of the self and observation of similarities, differences and relationships between the human being and animals. This study is extended through painting, modelling, play acting and poetry recitation. Geography study starts with the local area and its geographical characteristics. The class studies lives of the First Nations people before the arrival of Europeans, the effect of their arrival, intermingling between the peoples locally and the history of settlement in York Region, particularly Richmond Hill. The week-long experience conducting classes at the Black Creek Pioneer Village school is a highlight of the year as students attend daily, in costume. The experience extends to appropriate lunches (in baskets and Mason jars) and recess activities including stilt walking, skipping and marble playing. French grammar and reading, music (songs in parts, tenor and alto recorders) stringed instruments continued, eurythmy (a movement art), painting, embroidery, hand sewing and cross-stitch, physical education, form drawing, gardening. The Grade Five student is balanced; physical development and academic ability are both strong and stable, prior to the approaching changes of adolescence. Most students have good learning habits and are able to begin more detailed independent work. The study of ancient cultures leverages the students’ expanding academic capacities. Students experience the contributions of India, Persia, Mesopotamia, Egypt and Greece to our understanding of the world. This year marks the change from pre-history and mythic representations to formal Western History (classical Greeks). Study of Ancient Greece is enhanced by re-enactment of the Greek Olympic Games. A day of competitions in pentathlon, discus, javelin, wrestling, long jump and running are all conducted with a mood of reverence and striving for beauty. This event brings together students from a number of Waldorf schools, at TWS or another school, and is very significant in the Grade 5 calendar. Preparation of the chiton, the traditional Greek dress for competition, is enhanced by each student’s personal design and handwork. Grade 5 study of botany is ideally suited to the grounds of TWS with opportunity to observe plants directly in their natural habitat. Nature walks and sketching different varieties of tress and plants outdoors in their natural setting are part of the lessons. Grade Six students demonstrate a wide range of signs of puberty and adolescence. Some have lengthening limbs and faces, and become awkward and self-consciousness as they work to regain control of their changing bodies. Study of the ‘physical body’ of the earth, geology and mineralogy, matches the students’ experiences of changes in their bodies. Science study flows from observation of the phenomena such as sound, light, heat, magnetism and static electricity. Students move from observation to a basic understanding of how it works and exists in the world around them. This understanding is expanded to how technology and machines operate in our world. Astronomy also begins by observing the phenomena, the constellations in the sky, the movement of the stars, planets and our moon. The study is supported by poems and quotations on astronomical themes as well. Physics (sound, light and colour, heat, magnetism, static electricity), minerals and geology, Geocentric astronomy. Most students will have their 13th birthday during this year; some will enjoy a cultural ceremony or celebration to mark this milestone. Almost all students will have reached puberty, and be in the early stages of adolescence with accompanying highly charged emotions. Balancing the physical changes are the burgeoning intellect and a developing capacity for logical thought. Teachers approach material through observation as well as understanding the relationships between the material and human beings and society. The class looks for opportunities to contribute to the larger community by volunteering in a well-organized, structured program. Support for a food bank, or Out-of-the-Cold program gives students a larger perspective on life, and plants seeds for future growth. The adage ‘think globally, act locally’ is reinforced in the life of the class. The class play often draws on material from the Renaissance, and presents increasingly challenge to the actors. Over the years all students are assigned a large role to provide them with a challenging acting opportunity. French, orchestra, eurythmy (a movement art), knitting (advanced), woodwork (carving, objects with moveable parts), physical education (circus arts, team sports), gardening, visual arts. Grade Eight at TWS has a special quality as the culmination of the Lower School years. Many students have spent 8 or more years together, and see this year as the pinnacle of their school years to-date. History lessons focus on Revolutions(French, American and Industrial), mirroring the turmoil and yearning for independence students are experiencing as they enter adolescence. The Grade 8 project, a year-long independent study on a topic of the student’s choice, reflects the students’ status. Students are given a clearly defined process to conduct research and present it in correct academic form. They also present a model or visual presentation of the theme, make an oral presentation, and answer questions posed by classmates, teachers and parents. High School open mic nights are open to Grade 8 students, as the ‘seniors’ of the Lower School. The class play is another key marker of this year. The script, often written by a well-known playwright, challenges the students in their speech, acting and teamwork. Students support the work to prepare sets, props, costumes, make up, lights and backstage and house management. The resulting production is enjoyed by other students, teachers, parents and community members. Recent Grade 8 plays include Fiddler on the Roof and Midsummer Night’s Dream. The class trip is a key event, often involving a wilderness experience supported by guides. Most destinations involve nature activities, some with accompanying cultural experiences. The final event of the year is the Grade 8 graduation. Students present a program of music, skits and thank-yous; the teacher presents diplomas with a word about each student. The graduation is attended by many family and friends and other community members. French, orchestra, eurythmy (a movement art), handwork (machine-sewn garments), woodwork (stool), physical education, gardening, visual arts.